AUGUSTA, Maine — Gov. Paul LePage has sued Attorney General Janet Mills in Kennebec County Superior Court, alleging that Mills has abused her authority by refusing to represent the executive branch in court. According to a statement from LePage, the Democratic attorney general’s refusal to represent the Republican governor’s administration has cost the state hundreds of thousands of dollars, though Mills has authorized LePage to use private counsel on multiple occasions. At issue in the suit is whether the Maine attorney general is obligated to represent the executive branch in cases that the attorney general believes are unconstitutional or not winnable. LePage argues that the attorney general is bound to do so by the Maine Constitution, but the attorney general’s office has argued that the Maine Law Court gives the attorney general “authority and discretion” over whether to represent the governor. In Monday’s suit, LePage cited Mills’ decision to join other attorneys general in filing an amicus brief against executive orders by Republican President Donald Trump related to immigration policy. LePage requested a countervailing brief in the case, which he said Mills delayed and obstructed. Instead, Mills’ office gave the executive branch the authority to retain its own counsel as long as the fee was paid by the governor’s office. LePage’s office is being represented in the suit by attorney Bryan Dench for the firm Skelton Taintor & Abbott. Mills, who has been rumored as a candidate for governor in 2018, said Monday afternoon that she found LePage’s case “without merit” and that contrary to the spirit of the lawsuit, her office told LePage he could move ahead with his involvement in the immigration orders. Mills and LePage have a long history of conflict. In 2014, Mills refused to represent LePage in a suit over two of his initiatives that she had previously deemed unconstitutional. They involved a dispute between the state and federal government about whether Maine could drop some 19- and 20-year-olds from its Medicaid rolls, and a lawsuit filed against the state by Portland, Westbrook and the Maine Municipal Association over LePage’s attempt to change state policy on providing General Assistance to some immigrants. Mills allowed LePage to hire his own attorney in both cases. A federal appeals court ruled against the state in November 2014 in the Medicaid suit and the U.S. Supreme Court later rejected it. The failed suit cost Maine taxpayers $108,000 in legal fees paid to the private, Portland-based law firm Roach, Hewitt, Ruprecht, Sanchez & Bischoff. The administration paid the same firm about $100,000 in fees in the General Assistance suit, which went largely in LePage’s favor in June 2015 when the Maine Supreme Judicial Court ruled that the state doesn’t have to reimburse municipalities for General Assistance payments to refugees and asylum seekers who are not eligible for those benefits under federal guidelines. 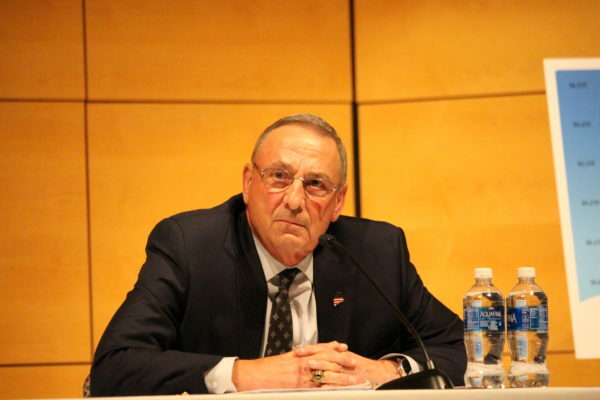 In 2015, LePage, who has long argued that the attorney general should support the governor’s interests, proposed that the position be a gubernatorial appointment instead of a constitutional officer who is elected by the Legislature. That proposal failed. In 2016, Mills warned LePage against using attorneys employed by the executive branch to handle legal matters that should be handled by her office. LePage reacted by saying he doesn’t trust Mills or her staff. Later last year, LePage and Mills clashed again, this time with Mills on the offensive over an education commission’s first meeting, which was by law supposed to be public but was held by invitation only at the Blaine House. The Maine State Law and Legislative Reference Library was unable to thoroughly investigate a question from the Bangor Daily News late Monday afternoon about whether a sitting Maine governor has ever sued a sitting Maine attorney general because the library’s records reflect only cases that made it to the Maine Supreme Judicial Court. The library did turn up a 1989 Maine Supreme Judicial Court case in which the superintendent of insurance sued the attorney general. Mills said the court ruled in that case that the attorney general is an independent constitutional officer endowed with common law powers. Read the full text of LePage’s lawsuit against Mills here.